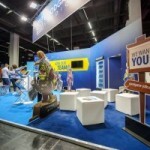 Once a year, all computer and video game fans have their eyes on Cologne when the gaming industry has a date with gamescom to present their innovations in the historic city. Although last year’s visitor record was not quite met, 335,000 people again flocked to the convention between 13th- 17th August – even though there were no new consoles to admire this year. What could be admired, however, were our new stands in the business and – for the first time – entertainment areas. After only being able to receive business visitors in previous years, our stand in the consumer area was accessible to all interested convention visitors, who accepted the offer in their droves. Also in our bag was, of course, our new building strategy MMO, Shadow Kings, which was only just released the week of the convention. Interaction was paramount on both stands. Our bingo box gave many of the visitors a good laugh at the consumer stand, where they were able to get information about exciting jobs to get them into the games sector and with a bit of skill, win some cool prizes. Our approach was naturally a bit calmer in the business visitors area. Here, less movement and more communication was our priority, and our coffee bar made for a good attraction and location for many good conversations and successful meetings with business partners, potential applicants and journalists. Many people came by more than once to get a caffeine hit to recharge their batteries amid the stress of the convention. 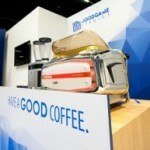 We were also present at the developer’s conference GDC Europe, which took place in the run up to the convention. With the announcement that in the future we will also develop games for the target audience of core-players and have thus licensed the use of high-end technology Unreal 4 Engine, we were able to provide plenty to talk about. By the end of the convention, all Goodgamers on location were in agreement that the trip to Cologne was once again a success.